Diversification could be defined as a changing strategy to introduce more products to an existing farming business so as to reduce the risk of economic failure of just one or a few enterprises. At a very small farmer level diversification, where food security is the primary consideration, it might mean farming with a mix of food crops, cash crops and various classes of livestock or poultry. The production would sustain a family with a wide choice of nutrients and create enough of a balance of different kinds of carbohydrates and proteins from the various own produced food. Any excess products can be sold for cash and create an entry level commercial farming enterprise. In Africa, as a continent, the greatest opportunities for diversification are located in farming areas with 500 mm to 1 000 mm of annual rainfall with a range of 17% to 22% rainfall variability. The medium to large farmers with proven sustainable financial success will face different challenges in future. Diversification would be carried out on a much larger scale to perhaps balance out the production and financial risk associated with the existing and established enterprises. Diversification should not be done for the sake of it but started by doing a detailed assessment of your farms resources and potential for producing other products. A huge investment in a new enterprise might in fact put the established business at risk. Irrigation on high potential soils near large human settlements or cities offer numerous possibilities ranging from dairying, cheese production, market gardening, beef production on pastures, various crops and an almost infinite number of possible farming enterprises. Established farmers would have determined a mix of enterprises that suit their farms location, and distance from markets, soil fertility and potential within the long-term climatic conditions experienced. 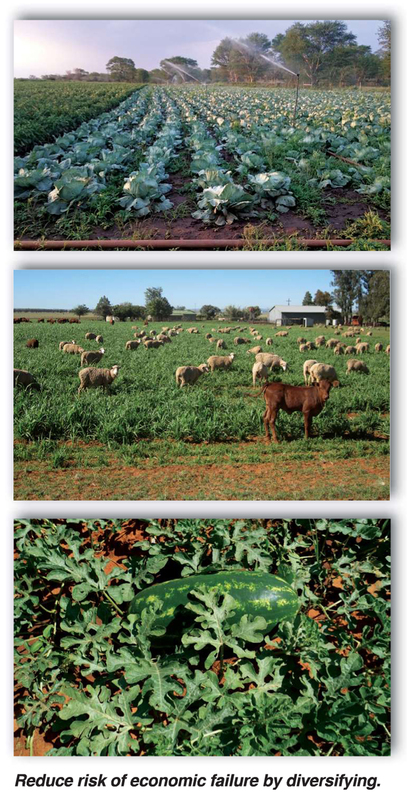 If there is already a mix of summer and winter crops, livestock and added value enterprises the diversification programme is probably complete. Many farms that concentrated on mainly maize production with conventional tillage have already diversified into crop rotations with soybeans, sunflowers, sorghum, potatoes, groundnuts and wheat or barley in the appropriate areas using conservation tillage. Lands can be fallowed within the system using cover crops and methods that ensure that part of the farm land has enough moisture stored so that these portions can be planted on time or early in dry cycles. A beef livestock factor usually goes hand in hand on large maize farms. The ruling commodity prices of the various crops will decide which crops can be introduced. Changing production methods of the same crops is a form of diversification to lower the risk of any one crop damaging the business permanently. The very dry years have ruined large monoculture maize farmers over the past ten years. However, in the Western production areas famers tend to fall back on mainly maize production using conservation tillage methods and feel that they would rather focus on doing the one crop well. Improved cultivars have also allowed the planting of maize over a longer ideal planting window. This year very late planted maize in the Kroonstad farming area on high potential yielded 7,8 tons per hectare. This is also a form of diversification within a largely maize monoculture farming business. The ruling commodity prices of the various crops will decide which crops can be successfully introduced into your ideal crop rotation plan. Crop rotations are now seen as one of the most important factors in financial survival as well as building soil fertility, spreading out the use of production equipment, and allowing for a balanced chemical weed control programme over changing crops. Maize futures on Safex for July 2019 are about R2 640/ton for both white or yellow maize. These and future prices for sunflowers at R5 210 and soybeans at R4 880 are only about 10% more than the commodity prices of ten years ago. It is evident that only the highest potential and well managed soils will produce a positive gross margin and hopefully net margin on just about all crops for the next few seasons. Any changes to diversify must be carefully costed using Safex price trends. For those farmers who have invested huge amounts in large tractors and machinery they are probably locked into their current production patterns for the next few years. Maize can be used to add value by feeding weaners, thinner mature beef animals, sheep or poultry enterprises such as layers or producing broilers being some of the more viable options. Adding value to maize by diversifying into these enterprises should be very carefully analysed as the huge capital cost to establish and enter these markets at a commercial scale is quite daunting. The skills required to run them at a profit must also be acquired over many years. Consider diversification but be very careful in deciding which enterprise in which to invest.